What&apos;s on my original iPhone? 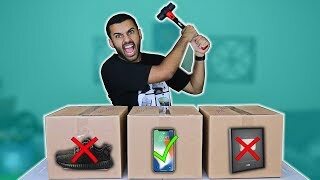 SMASH WHAT&#39;S IN THE BOX CHALLENGE!!! (WORST IDEA EVER!!) Gone horribly... horribly wrong.. SMASHING WHATS IN THE BOX CHALLENGE!!! Gone horribly... horribly wrong.. LINK TO MY VLOG CHANNEL!! NINJA STARS GOES UP TOMORROW!